Joe V’s Smart Shop is an HEB store with 2 locations. You can find their page here. They do accept coupons at face value. Most of their prices are about 15%-30% lower than a regular HEB store. Sanderson Farms Whole Chicken – 47¢ lb. Large Cantaloupe – 77¢ ea. Boneless Skinless Chicken Breast Fillets – $1.47 lb. H-E-B Original Flour Tortillas – 20 ct. – 90¢ ea. Colgate Toothpaste – 3 oz. assorted varieties 85¢ ea. – There are several coupons out for Colgate, so use what you’ve got. Most recently, there’s a .75/1 in the 5/1 SS. Calabaza Squash – 57¢ lb. Kleenex Cottonelle Bath Tissue – 9 rolls – $2.50 ea. And I have a confession. I’m a grocery store tourist. When I hear about a new store in my area, even if it’s off the beaten path, I want to go… I want to know their policies, and I want to know what they’ve got that some of my other favorites may not. 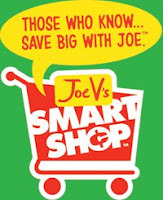 I heard about Joe V’s Smart Shop a few weeks ago from…somewhere. Maybe the Houston Chronicle, maybe Facebook, maybe Twitter, and I just had to check them out. And to my surprise, it’s a store I would shop at again. The prices were about 10-15% lower than HEB’s prices, but some things are obviously loss leaders for them. I saw bananas 3 lbs/$1, Kellogg’s cereal for $1.50, and milk was only $2.49 when I was there. Here’s their Facebook page. They accept coupons at face value, but don’t take credit cards. Cash, debit, or EBT only.